Dr. Robert Rothfield, a board-certified plastic surgeon in Ft. Lauderdale, FL, recently discussed simple, key factors all patients should address when considering cosmetic enhancement. To ensure their safety is the top priority, regardless of whether a patient is undergoing breast augmentation, tummy tuck, or liposuction, Dr. Rothfield says patients should at least verify a surgeon’s certification and hospital privileges. 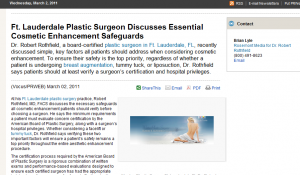 At his Ft. Lauderdale plastic surgery practice, Robert Rothfield, MD, FACS discusses the necessary safeguards all cosmetic enhancement patients should verify before choosing a surgeon. He says the minimum requirements a patient must evaluate concern certification by the American Board of Plastic Surgery, along with a surgeon’s hospital privileges. Whether considering a facelift or tummy tuck, Dr. Rothfield says verifying these two important factors will ensure a patient’s safety remains a top priority throughout the entire aesthetic enhancement procedure. The certification process required by the American Board of Plastic Surgery is a rigorous combination of written exams and performance-based evaluations designed to ensure each certified surgeon has had the appropriate training to perform a range of safe and effective plastic surgery procedures. Dr. Rothfield stresses that while finer nuances do exist with each procedure, from BOTOX Cosmetic® to liposuction, to tummy tucks and facelifts, a baseline standard is established when a surgeon achieves board certification that places him or her in an elite class of exceptional practitioners. Similar to the difference between a surgeon who is board-certified and one who is not, the difference between a free-standing surgical center or hospital and an in-office operatory room is significant. Dr. Rothfield says one main difference is the size of the facility’s budget, as hospitals and surgical centers tend to have large capital budgets that allow them to implement the latest technology and newest equipment. However, he adds that the key difference between an office set up and a free-standing surgery center or hospital is in the ability to handle an emergency. Whereas an office facility is limited by the personnel available (i.e., one doctor, one nurse, etc…) hospitals and free standing surgical facilities have a team of physicians and nurses available at all times. Dr. Rothfield says validating a surgeon’s certification and a facility’s credentials will lead to the safest cosmetic plastic surgery enhancement possible, across the spectrum of available procedures, from breast augmentation to BOTOX Cosmetic®. He adds that in the end, verifying these two important factors can lead to exceptional results and increased patient safety. Robert E. Rothfield, MD, FACS is certified by the American Board of Plastic Surgery and the American Board of Otolaryngology. He earned his medical degree from the University of Miami School of Medicine. Dr. Rothfield then completed his general surgery residency at Western Pennsylvania Hospital, an otolaryngology residency at the University of Pittsburgh Eye and Ear Institute, and a plastic surgery residency and hand surgery fellowship at Baylor College of Medicine. He is Chief of Plastic Surgery at Memorial West Hospital in Pembroke Pines. Dr. Rothfield is also affiliated with Memorial Regional Hospital and Joe DiMaggio Children’s Hospital in Hollywood, FL, as well as Memorial Hospital Miramar in Miramar, FL. He is a fellow of the American College of Surgeons, and a member of the American Society of Plastic Surgeons, the Florida Society of Plastic Surgeons, and the Broward County Society of Plastic Surgeons. Weston Plastic Surgery is located at 2300 N. Commerce Pkwy., Ste. 202 in Weston, FL 33326, and can be reached at (866) 417-6996 or found online at www.westonplasticsurgery.com or the Weston Plastic Surgery Inc. Facebook page.